Mega Sale! Free Shipping Included! Save 25% on the GPI 113255-4, 01N31GM Nylon Turbine Water Flowmeter with Digital LCD Display, 3-30 GPM, 1-Inch FNPT Inlet/Outlet by GPI® The Proven Choice® at Scranton Sewer. MPN: 01N31GM. Hurry! Limited time offer. Offer valid only while supplies last. 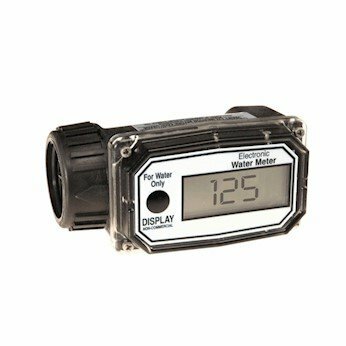 The GPI 01N31GM digital turbine water flowmeter is made from durable nylon and features an LCD display that is accurate to +/-5 percent of reading. The GPI 01N31GM digital turbine water flowmeter is made from durable nylon and features an LCD display that is accurate to +/-5 percent of reading. This economical turbine meter is designed for flow rates from 3 to 30 GPM and is factory calibrated in gallons for use with water. The lightweight 01N31GM mounts easily to the end of a hose and is ideal for use with free flow gravity systems or combined with an electric transfer pump as part of an irrigation or water management system. The GPI 01N31GM digital flow meter has 1-inch FNPT inlet/outlet and comes with two standard AAA batteries. Typical accuracy is 2.5 percent (accuracy can vary to 5 percent). Can be mounted on hose end for easy meter reading. Powered by two field replaceable AAA batteries (installed). Features one cumulative and one resettable batch total. For use with water. Wetted materials: nylon housing, nylon rotor, ceramic bearings, tungsten carbide shaft, 316 stainless steel rings and ferrite signal generators.